Kaltura CaptureSpace will be retired on June 1, 2019. The following instructions are for CaptureSpace's replacement, Kaltura Personal Capture. 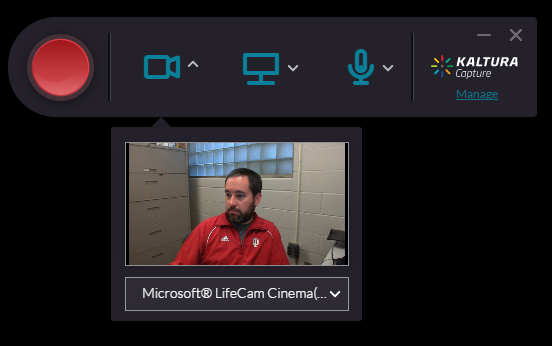 Kaltura Personal Capture, Indiana University's personal capture solution, is a desktop application that helps you record presentations and screencast using any combination of voice, webcam video, screen action, and PowerPoint slides. Recordings created in Personal Capture can be uploaded and managed alongside other Kaltura content in MediaSpace and/or the Kaltura tools in Canvas (My Media and Media Gallery). Personal Capture has a maximum recording time of two hours. If you are recording and reach the two-hour mark, Personal Capture will end the recording. At the top right, click Add New, and then select Personal Capture. If your browser prompts you to approve the download, select whichever option allows the download to proceed. In Windows, click the Personal Capture installer, and then follow prompts to complete the installation. In macOS, drag the Personal Capture icon to the Applications folder. When the installation is complete, return to MediaSpace; then, to launch the software, click Add New, and then select Personal Capture again. If you encounter a permissions error while installing Personal Capture, contact your department's IT Professional or desktop administrator. For instructions with screenshots, see Kaltura Personal Capture User Guide. This is document ahpu in the Knowledge Base. Last modified on 2019-02-20 12:11:47.